Writing is hard. So is publishing. It’s easier than I want to admit to fall into a downward spiral of imposter syndrome. Or something worse. But there are ways to combat that spiral of doom. For me, that spiral consists of workaholic syndrome. I will write, write, write until I burn out, and sometimes, I’ll try to write even when I know I’m burnt out and need to rest. I mean, there’s always something to do, right? Whether it’s outlining, writing, editing, querying, or marketing, a writer ALWAYS has something on their To-Do list. It’s easy to lose yourself in that madness. So what’s one thing you can do to prevent writer’s madness? 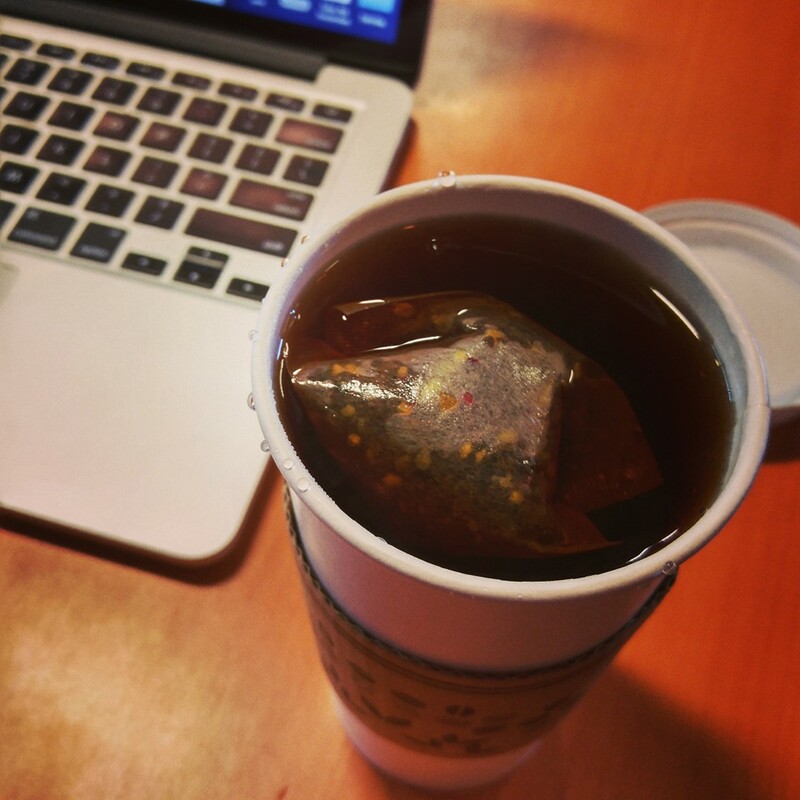 Reward yourself when you finish a novel or sign with an agent or get your first publishing deal. Get those new office supplies you’ve always wanted. Or take the day off to read. Writing is often a lonely, thankless endeavor. 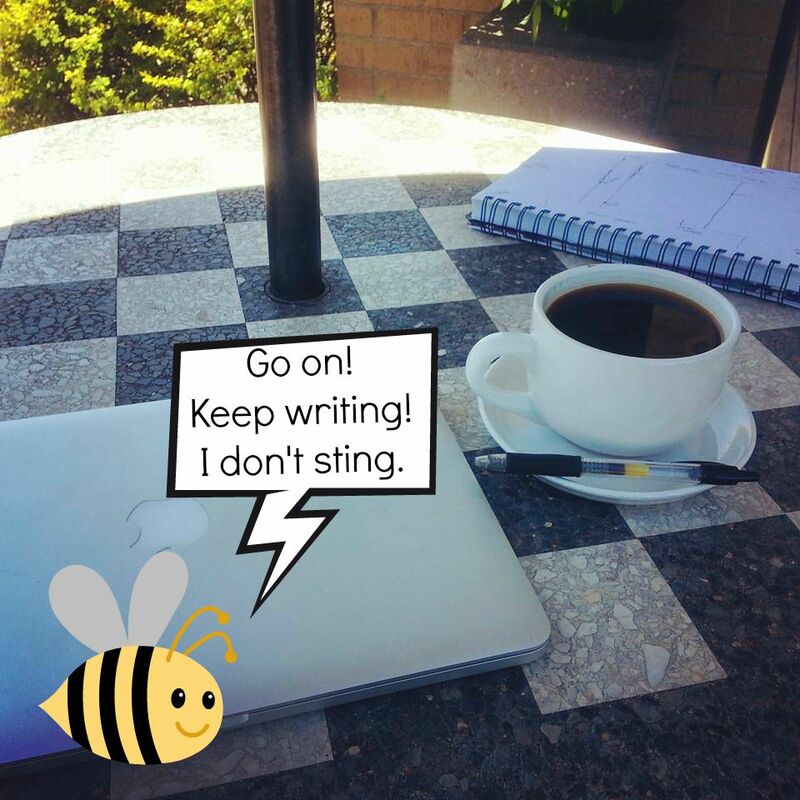 After spending months writing a novel, it can hurt to hear questions like “When will it get published? Where’s your movie deal? Oh, you’re still doing that writing thing?” It can gnaw at you. Granted, I don’t expect anyone to thank me just for writing—don’t get me wrong—but it’s okay to thank yourself for continuing to follow your dreams. So many people claim they will write a novel and never write a word. The fact that you are moving forward is worth something. You haven’t given up, and that’s awesome. By taking a moment to acknowledge that, you’re encouraging more positive feelings than negative ones. You won’t get so lost in the pressures of publishing or succumb to imposter syndrome. You will enjoy the writer’s journey. My advice? Make goals, and when you reach them, take a moment to celebrate. Every time I finish a novel, I buy myself a trinket—like a coffee mug or, more recently, a Funko Pop of Tuxedo Mask for my desk. Why? Because it’s part of my writing ritual. Every gift is under $10, but each item feels priceless. It represents time and effort and the passion I have to move forward. Those trinkets remind me of that on the hard days in between. Maybe you’ll buy a coffee mug like I do—or maybe you’ll bake brownies on the weekend. Something. Anything. Even just a nap. Let yourself enjoy that goal you reached. And then, set a new one. 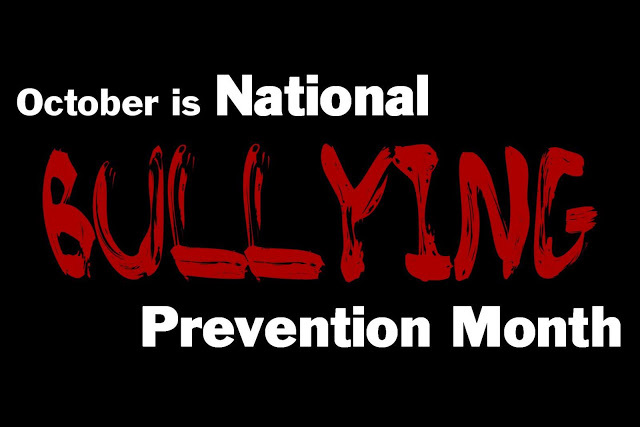 October is National Bullying Prevention Month, and Clean Teen Publishing participates by hosting giveaways and sharing posts about bullying. This is my story. I was twenty-one and out on the town with a friend one evening—a rare event for an introverted writer and cat lady, such as myself—when I found myself on a bar’s balcony. My fourth novel had just released less than a month ago, so perhaps that was why I allowed myself to leave my writing cave for some fresh air. I never expected to run into her. A bully from my high school days, my days when my first novel released. She was there, standing on the same bar balcony as me, a girl I hadn’t seen since graduation day (which was only a few years ago at that point), but she was doing more than that. She was talking to me. It took me a moment to realize she was talking to me. And not just that. She was smiling at me. I thought the Matrix had a glitch. This girl used to laugh at me. Now, she looked prepared to laugh with me. There was no acknowledgment of our history, and I was so dumbfounded I simply stood there and listened to her ramble on and on about her life. She had gone to college, dropped out, taken time to think, and now she was going back. She wanted to be a writer, maybe even a poet, but she wasn’t sure how to go about it. In fact, she went on to quote a few of my blog posts and other articles. My blog. My writings. My tips and tricks. She had read hundreds of thousands of my words, and I was the one that was now speechless. Quite a few others picked it up, so it’s a phrase I’ll never forget. Now, I’ll never forget the way she asked for my help. Bullying is a complicated, distressing topic. It is disheartening, crushing, and sometimes—oddly—empowering. Now, I’m not giving bullies any credit or saying it’s okay to be one—it’s not—but I know, in my instance, they pushed me to prove them wrong, to write better, to get somewhere faster. And when I got somewhere, I learned from the bullies themselves why they did what they did. Most didn’t have the support at home to do what they wanted to do—which was the same thing I was doing (writing)—and they lashed out at me because of it. I could’ve told that girl off. I could’ve ignored her or laughed at her or had her send me some poems and then told her to go write a good one. But I didn’t. I helped her by handing her my business card and answering a lot of her initial questions about the publishing process. She was one of my many bullies. Now, she is a fellow writer, trying to follow a dream, and I’m sure she has run into a bully trying to stop her from succeeding. We all have. But I often wonder how different her life would’ve been if she had simply approached me back then and asked those questions. She may not have had the support at home or from her friends, but I would’ve supported her dreams, and I would’ve introduced her to more people who supported her dreams. Alas, we make decisions, and they aren’t always the best, most logical ones. I’ve never judged my bullies, even the ones who made fun of me when my mother died. A fact I still can’t wrap my mind around completely. But many bullies come from broken homes. I did, too. When my mom suddenly died, I was eleven, and naturally lashing out, I did quite a few mean and awful things as a preteen that I cannot take back. I sometimes wonder if I am the bully in someone else’s memories, if I have ever walked up to them and smiled and asked them how their lives are going, and not even realized who I was to them. Maybe that is the worst part of bullying. The perspective. The timing. The complications around such emotions. But maybe, just maybe, if we talked about it more, if we helped both sides of the equation, we could understand that we are all human and we could prevent more situations where feelings were hurt and dreams were lost. We could help one another achieve greatness. The paperback of Death Before Daylight releases on October 19! Two days later, on October 21, you can come see me at Headrush Coffee and Tea Roasters in Kansas City, Missouri for a paranormal talk and book signing. I was just up there the other day, and they had me try their blood orange pu-reh tea. It was amazing. In other news, a few of you have asked me about my services since NaNoWriMo is about to take place. I am taking on new clients as soon as I get back into town today, so please feel free to email me at shannonathompson@aol.com. Since I haven’t shared/updated in a while, I thought I’d share some recent books I’ve worked with. You’ll now find them on my Services page and my Reviews page. Release days are like bees. (How’s that simile?) If you’re like me, you both hate and love bees…and I’m unusually (and pathetically) terrified of them…even though I’ve only been stung once…and even then, I hated them long before one stung me at a bus stop while I was innocently sitting, doing nothing to deserve the pain of a sting. (I promise.) But, despite all of this, bees are necessary. They are BEYOND necessary. Watch one, tiny documentary on them and you’ll know that. Reading The Secret Life of Bees helps the phobia too…not to mention getting a giant stuffed animal bee at the age of seven that you named Whassup-B when it was cool. Yay! The 90’s! I cannot, for the life of me, get over my fear of bees, and much like my phobia of the little stingers, I cannot overcome the emotions of book release day. On one hand, I should bee excited—(See what I did there? See? )—on another, I’m petrified it’ll sting me. Sting me with what? I have yet to figure that out. A book release has, in fact, never stung me. I don’t even KNOW what I mean by that. How silly am I? I only know that there is a fear (a phobia) that doesn’t make much sense, and yet, I keep facing it over and over again, year after year. Shannon wrote this while sitting outside and a bee scared the crap out of her. I’ve written about this quite a few times on here, and have yet to get the answer I’m looking for. I think that’s because there are more than a couple of answers that would suffice. Originally, for instance, I used to think that it came down to sales, but then, I realized it didn’t. Not at all. Having just one reader is enough for me. (But having hundreds is great too. :P) I moved on from sales, thinking it must be something else, and went to book reviews, but realized a similar thing. Book reviews aren’t even for me; they are for the readers. So, I moved on to future contracts…and knew it wasn’t that because I’ve been okay thus far, but this did get me thinking about the future in a new way. Maybe it comes down to not knowing where the next step will lead you. Maybe it comes down to a moment that you know your adventure has ended and now you must take a new one. Maybe it comes down to letting go of the past and moving forward into the future. A book release is a new adventure for the reader, but it’s the moment of letting go of that adventure for the author. It’s a very contradicting feeling, one I have yet to fully grasp, but then again, I think that’s the beauty of it. It’s complicated, and messy, and scary, and all-around lovely. I think I’m ready for all the adventures to come. 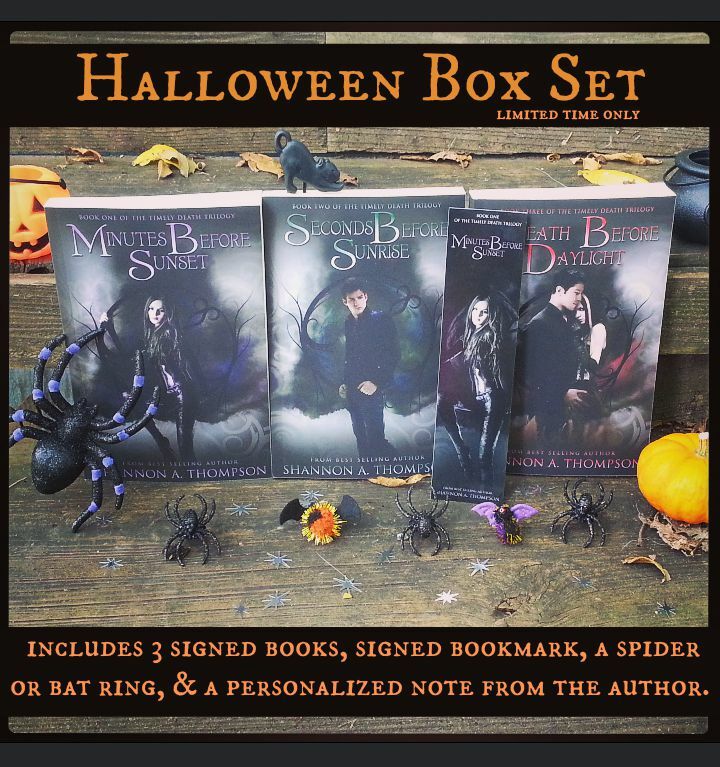 Death Before Daylight releases in 10 days! 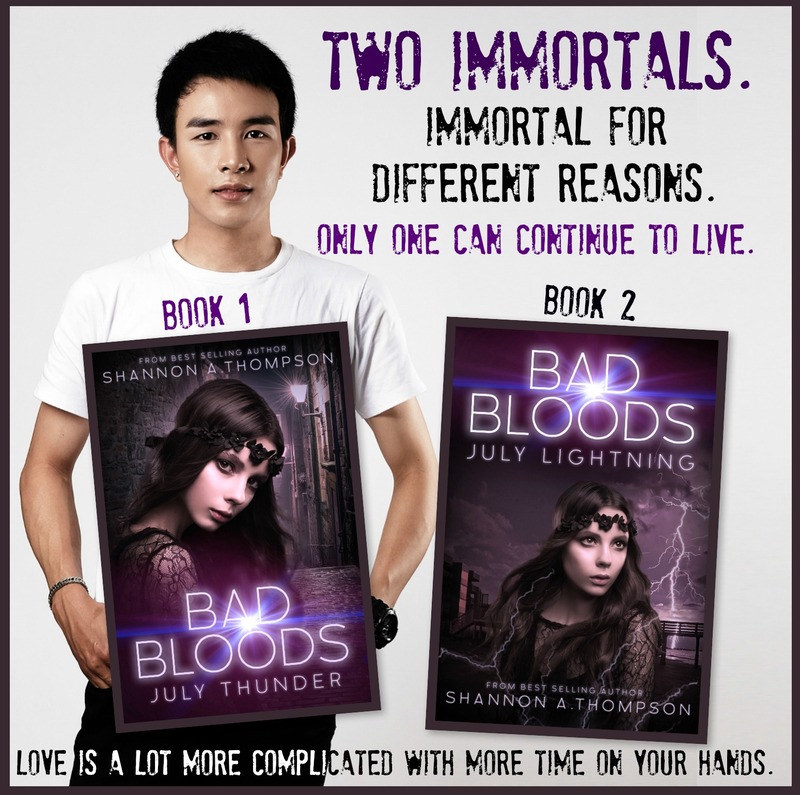 You can pre-order the last book of The Timely Death Trilogy on Amazon, Barnes & Noble, iBooks, and basically everywhere books are sold. If you want to be a part of the release day, you can sign up for a release day blast by clicking here! 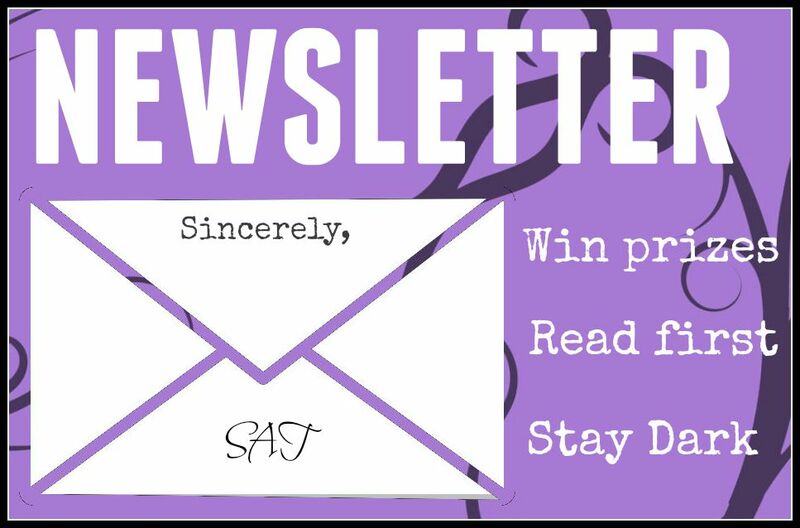 I will also be sending out an opportunity to win prizes by helping via my newsletter. That being said, some big things are happening, and I can’t wait to tell you all about them, but until then, check out the first book in the trilogy. 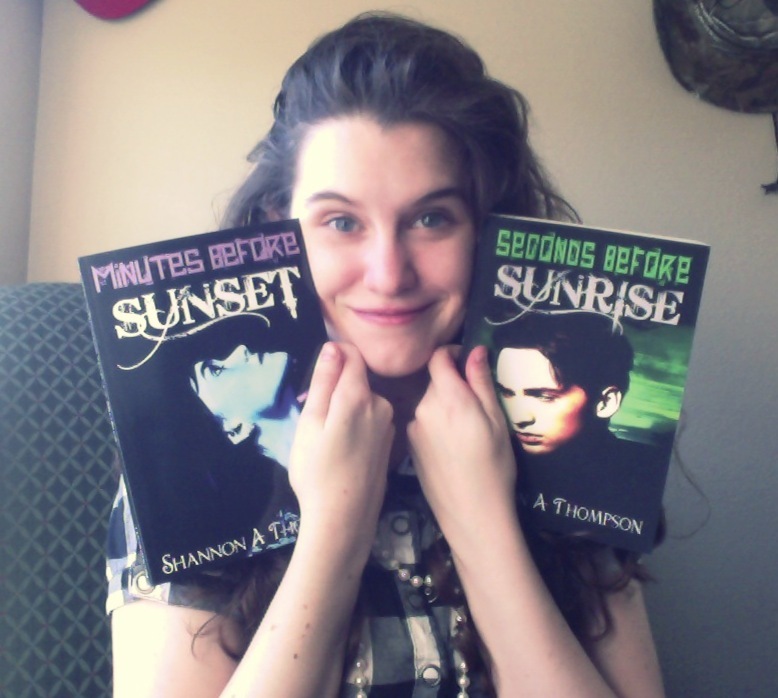 Minutes Before Sunset is free! (Amazon, Barnes & Noble, iBooks.) The sequel is out too. 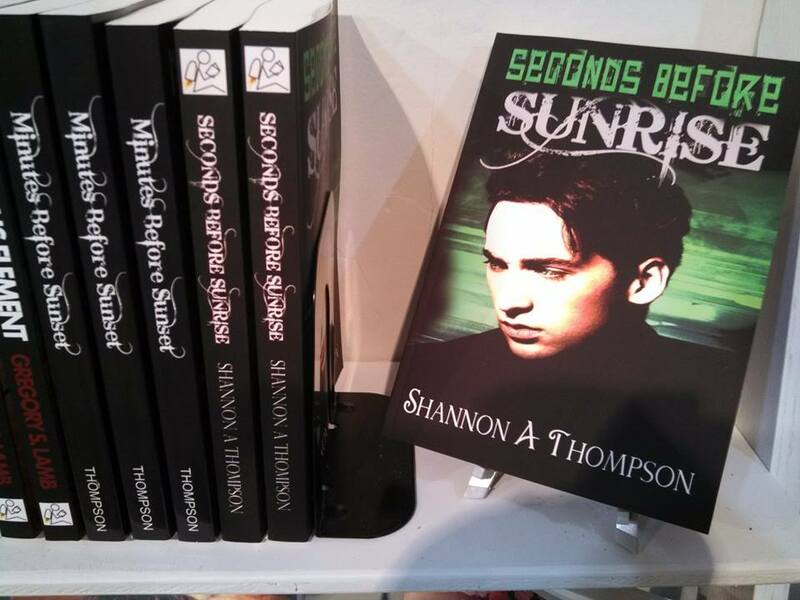 In fact, we’ll be celebrating the sequel, Seconds Before Sunrise, September 7-18 during the blog tour. That’s all for now. 😉 More to come soon! Special thanks goes out to Tony Jaa, actor and martial artist, for quoting my latest novel, Seconds Before Sunrise, on his official Twitter page. 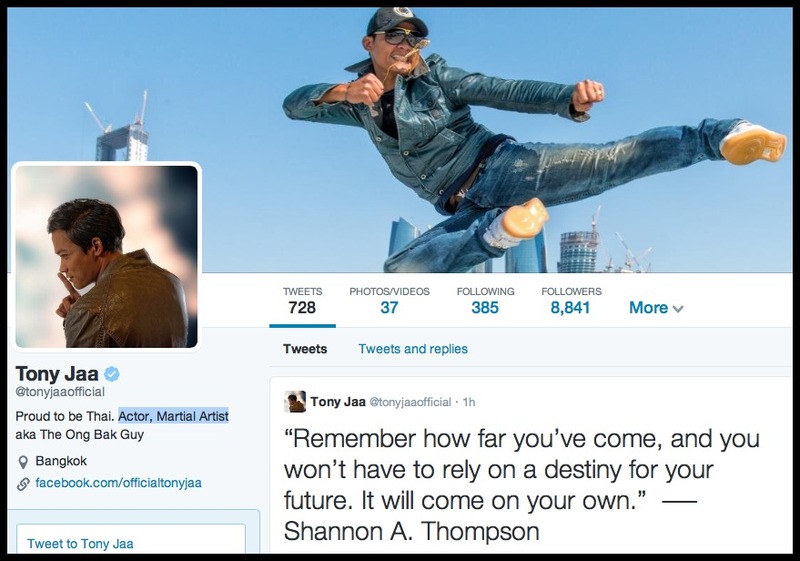 Known for Ong-Bak, Fast and Furious 7, and his stunt work in the Mortal Kombat Annihilation, visit Tony Jaa on Twitter and Facebook. 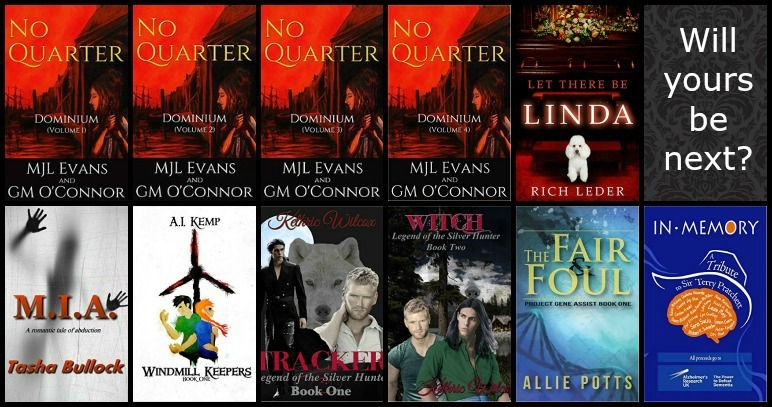 Check out my latest interview with Confessions of a Book Geek! I explained the specifics of my book covers, and I also invited five of my characters to lunch. It was a great time, so read it by clicking here. Today is Mother’s Day – and as many of you know, my mother passed away very suddenly when I was eleven years old. It’s not difficult for me to write about it necessarily, but there is this peculiar heaviness that happens on days like these. I say “peculiar” because it shifts every year. Sometimes, it is crushing, and other times, it is a wave, but it’s always sad. So I find myself doing what I do every year – and that is to find a way to celebrate her life and her love. And I did. She was the definition of an avid reader. In fact, when she passed, we donated most of her novels to a half-price bookstore, and they joked that an entire library – not a family – was donating. My mother was a library. We had these beautiful, tall oak bookshelves, and she layered the shelves with enormous collections of trinkets. (Hence why I always talk about trinkets.) But she also kept bookmarks, and I reflected on that today – thinking of what bookmarks have meant to me. “This is where i fell asleep” is my oldest bookmark. It was my favorite when I was a kid. I believe I read all of the Dear America books and the Magic Tree House series with this bookmark slid in the pages. I even remember getting it at a book fair. (I think they were cheaper because of the grammatical error, but I’m not sure? I think the i” was definitely on purpose and probably didn’t go over well with parents.) ANYWAY – I loved animals, so this was perfect for me. It used to even have a little puppy attached to the top, but that didn’t last for very long [obviously]. I don’t use it anymore, but it sits on my shelf of accomplishments. (Yes, I have something as egotistical as a shelf of accomplishments ::sigh:: It’s how I stay motivated.) But this bookmark reminds me of childhood and how I lost myself and found myself in novels, whether it was my first You Choose the Story Scooby Doo books, Goosebumps, or The Journal of Scott Pendalton Collins: A World War 2 Soldier. (My favorite Dear America book.) This bookmark is a memory because this bookmark represents my childhood love for novels that continued into my adult life. 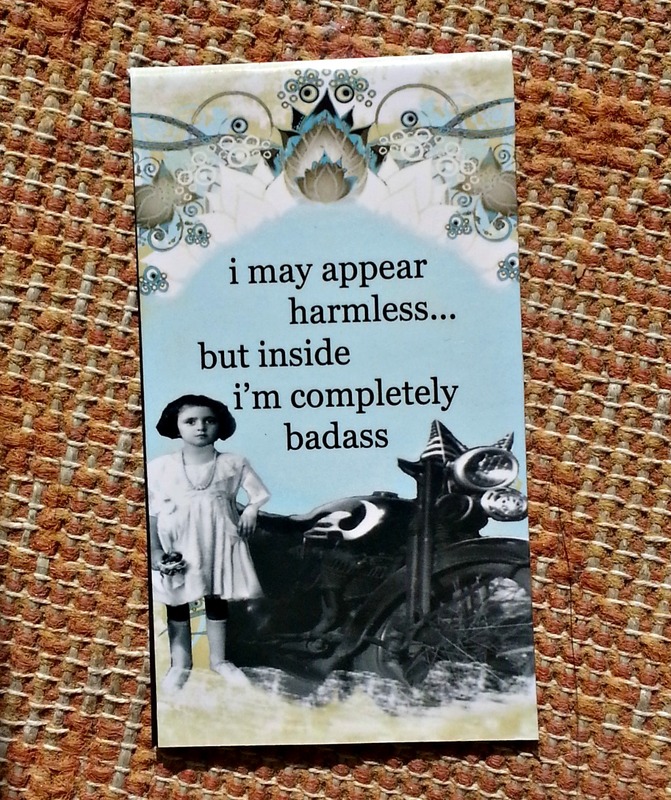 “i may appear harmless…but inside i’m completely badass” This is my current bookmark, and I love it so much. (And I also just realized the I have a thing for “i” being lowercased.) 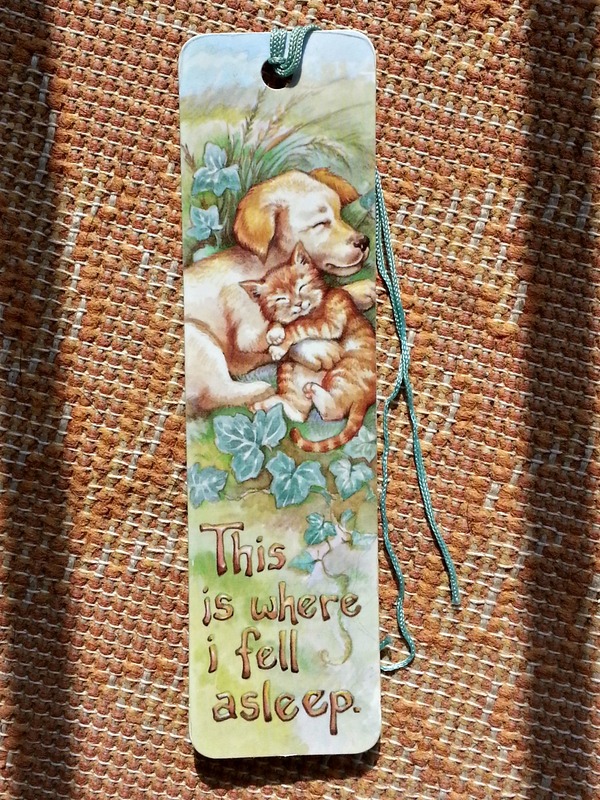 This bookmark was a gift I received from a wonderfully talented painter, and it brings a smile to my face anytime I open a book and read the words. Just as a friend does, it makes me laugh, smile, and enjoy the time ahead (in this case, a novel.) Also, who couldn’t love the phrase? If you still need coaxing, it’s a magnetic bookmark – so it never falls out. This is good for clumsy readers such as myself. And – once again – like a friend, it is prepared more than I am. It knows I’m clumsy, even before I remember I am. The fact that it is also a gift reminds me of how much a gift can warm a heart up, no matter how small it is. This bookmark is a friend because this bookmark reminds me of laughter and staying true to myself. “A hundred years from now, the world may be different because I was important in the life of my child” This bookmark is the most important bookmark that I own. It was my mother’s, and she was actually using it when she died. I keep it in a memory box to keep it safe, but this bookmark reminds me of how much she loved her family and how much she believed in all of our futures. On the most difficult days – like Mother’s Day – it shows me how she would still be encouraging me if she were still alive, and in a way, she does encourage me by leaving behind a bookmark like this one. I may not be able to live up to the bookmark. I may not be able to change the world in 100 years. But I can at least try to change the world around me by encouraging and helping others to follow their dreams just as my mother encouraged me to follow my dreams. Bookmarks don’t only mark a stopping place in a novel. They can symbolize parts of life and remind us of all the strength and passion we have to live for. For me, they mark places in my heart , but they also remind me of where I left off so I can begin again. Special thanks to Mrs N of Princess of the Light: Shining the Light for All for nominating ShannonAThompson.com for Blog of the Year: 2013 and the Dragon’s Loyalty Award. 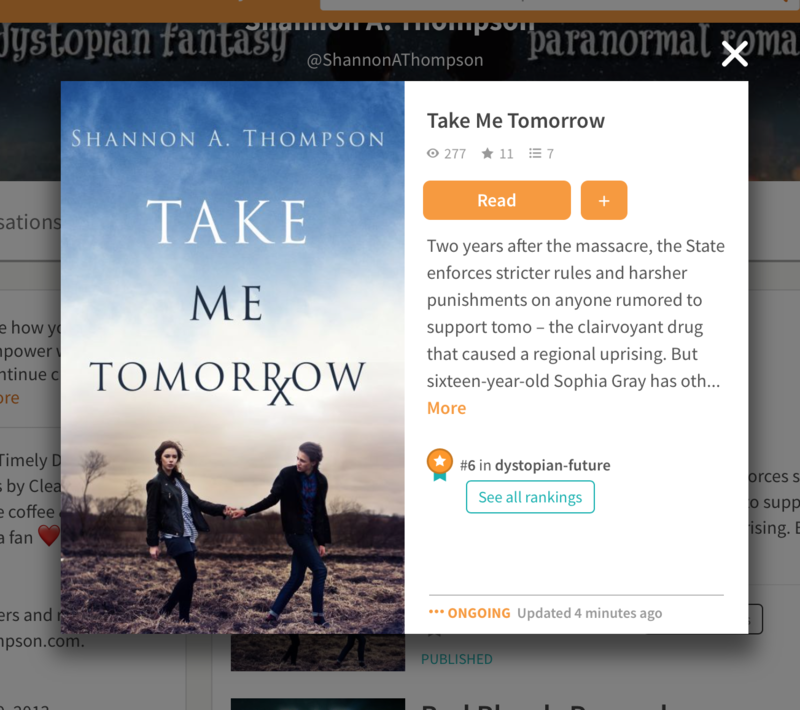 Another special thanks goes to Jennifer K Marsh, author of ILIMOSKUS, for nominating ShannonAThompson.com for the WordPress Family award. Today, I am delighted to announce that I was able to interview Andrew Vogel, the actor who played Carter Thibodeau in Under The Dome On CBS. You might have seen a photo of him holding Minutes Before Sunset in my last post. Afterward, he was nice enough to agree to an interview, and you can read it below. Shannon: Hi, Andrew. Thank you for talking with me today. Shannon: When do you remember deciding to become an actor, what inspired you, and how did you go about it? Andrew: Well, I think I was always somewhat of a performer. I had done plays throughout grammar school and high school. It was always fun for me to be in front of people. Although it was always nerve-wracking and still is. But I never saw acting as a career option and ended up studying psychology in college. But even then I was always working on different creative projects. I even had a comedic rap group going at one point. At the same time I enrolled in grad school for business of all things, I enrolled in a local acting class. Almost immediately I dis-enrolled from grad school and decided I wanted to give film acting a run. The class had certainly awoken my passion for the art. I had taken a year off after undergrad to work retail and I was flat out miserable. It was one of those things where I just knew it wasn’t what I was supposed to be doing. I don’t know if that year inspired me, but it certainly made me realize that I would never be content if creativity wasn’t a significant part of my work. Anyway, I began training for film acting and also working retail part time. Which still wasn’t satisfying enough. Did I mention I don’t like working retail? But soon enough, through some good contacts and well placed volunteer efforts, I landed a job as the Editor of Louisiana Film and Video Magazine which allows me to work from home and virtually pursue my creative endeavors full time. Shannon: I also hear that you have a passion for directing. What do you like most about directing and do you have any upcoming plans with it? Andrew: I directed one short film for a 48 hour film contest. It was one of the most rewarding creative experiences I’ve ever had. I had my hand on every detail of the film from the overall vision down to props and costumes. I think what I loved the most was the chaos of it all. There was so much creative freedom within that chaos. Ideas were flowing off the cuff for myself and the entire team. My wheels were turning as fast as ever, and yet I was forced to be in the moment and keep things moving. There was no time for creative blocks. We made decisions, improvised and adapted. It’s amazing what ended up remaining of the original vision by the time it was all said and done. We had added so much richness by the end of the project that wouldn’t have been there if it wasn’t for the driving force of chaos. Never have I felt more focused and alive, ha. The feedback we got on the film after the contest was as good as we could have hoped for. Unfortunately, we turned it in a bit late and were not eligible for awards. On the upside, we did another version of the film with more footage and better quality sound that we are sending out to festivals. Nothing is set in stone yet, but myself and the original crew of the 48 hour project are always cooking up new ideas. I certainly plan on directing again in the near future. Shannon: What has been your most interesting experience as an actor? 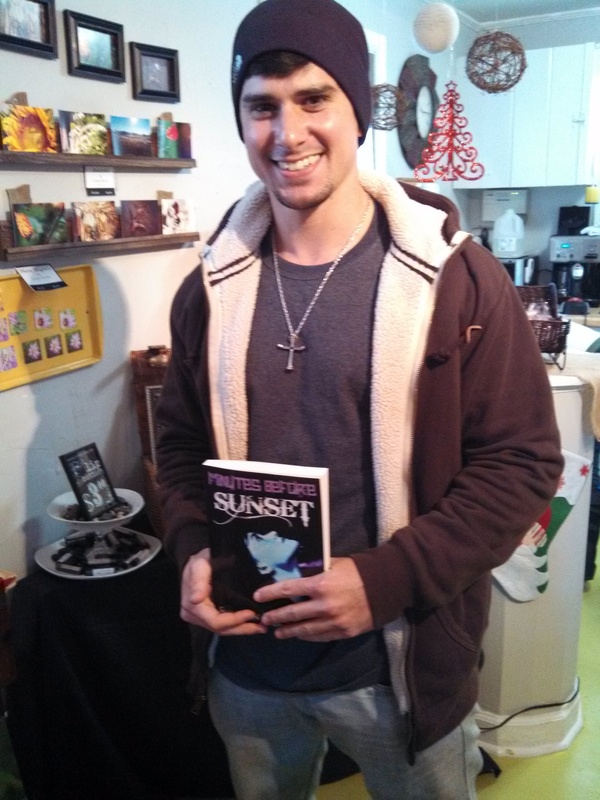 Andrew Vogel with Minutes Before Sunset. Andrew: Being on set as an actor is always interesting. You kind of fall into a bubble where the outside world doesn’t seem to exist. And you tend to quickly get to know the people you work. Often times there is little sleep and a lot of waiting. That combination leads to interesting conversation. For me, my favorite moment as an actor was my first day on Under the Dome. Keep in mind I had never worked on a project near this size before so I was excited to say the least. I felt like I was living the dream. I mean, I was getting paid to do what I love in a city I’ve never been. I had a king suite at the hotel, a personal trailer on set, and food on demand. Not a bad setup for a layman. So after being delivered a breakfast burrito to my trailer, I was taken to set with some other actors. They all seemed cooler than me. And probably were. Once I was on set, I was introduced to the director who responded, “I know who he is. I hired him,” and followed by telling me, “Do exactly what you did in the audition.” I was nervous at first. The scenes I was in seemed to revolve around my character, Carter, who is an older bully crashing a high school party with a sixer of beer and a bravado worthy of Steve Stifler. After my first take which to me felt shaky, the director said to me, “That was bleepin perfect,” and proceeded to give me minor technical notes. That in combination with a seemingly endless amount of takes had me feeling confident. By the end of the day I was teaching extras how to spin beer bottles in their hand and seeing how many winks I could fit in before they yelled “cut”. Slight exaggeration. Shannon: Is your favorite genre of film to work with different from your favorite genre of film to watch? Andrew: I don’t think I have a favorite genre to work with yet. I’m certainly still discovering my strengths and weaknesses. As a dream role I would like to play a villain in one of those comic book movies. It’s hard to put a label on my favorite movie genre to watch, but I like films that have psychological or philosophical depth. Preferably with surreal or fantastical elements. In my opinion, a good film, like a good book, leaves me thinking afterwards. Shannon: Has any one specifically encouraged you to become an actor? Has any one discouraged it? What are the best and worst parts about these careers? Andrew: Since my decision to pursue a career as an actor, most everyone has been supportive. My parents have always encouraged me to perform I think from a young age. Because they knew I enjoyed it. More people are supportive since Under the Dome. Go figure. I’ve always been a high-risk achiever. Meaning I try to accomplish the unlikely. And there’s always been people who have told me that I couldn’t do something, and then when I do it, they look for some sort of corruption. That’s okay though. I think the people closest to me have learned to expect the unexpected. The best part about my career is the fact that I do what I love as a profession. The worst part is being rejected over and over. But even that isn’t so bad. I’m at the point where, unless it’s a major audition, I forget about auditions as soon as they are over with. If you care about having a lot of money, it’s a much tougher road. Shannon: Finally, do you have any inspirational quotes or thoughts to share with those aspiring to become an actor or director? Andrew: My philosophy in life is simply to pursue passion and never stop exploring. If you aren’t sure what you are passionate about, then explore life with an open mind until you do. Finding passion will guide you to truth and happiness. That being said, first make sure you want to act or direct for the right reasons, then jump in head first and don’t look back. Be bold. Take chances. 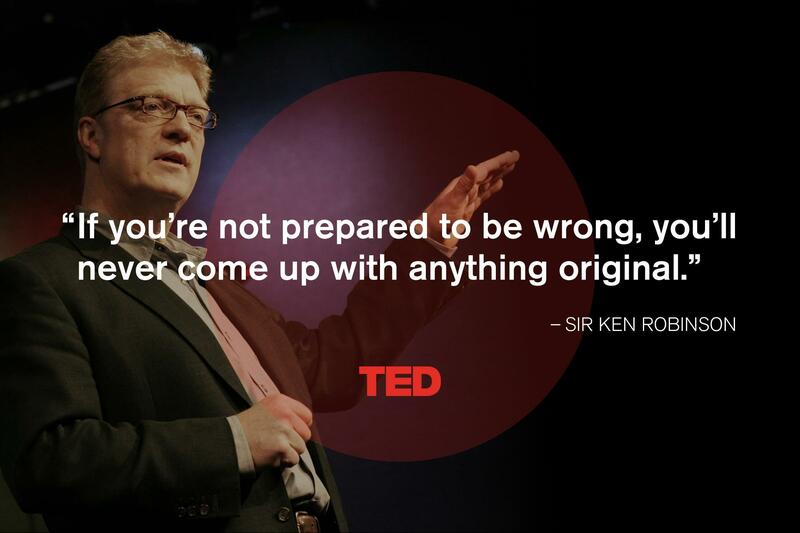 And no matter how much talent you think you might have, be prepared to start from nothing and learn from the best. Without humility and flexibility, you won’t grow as an artist. 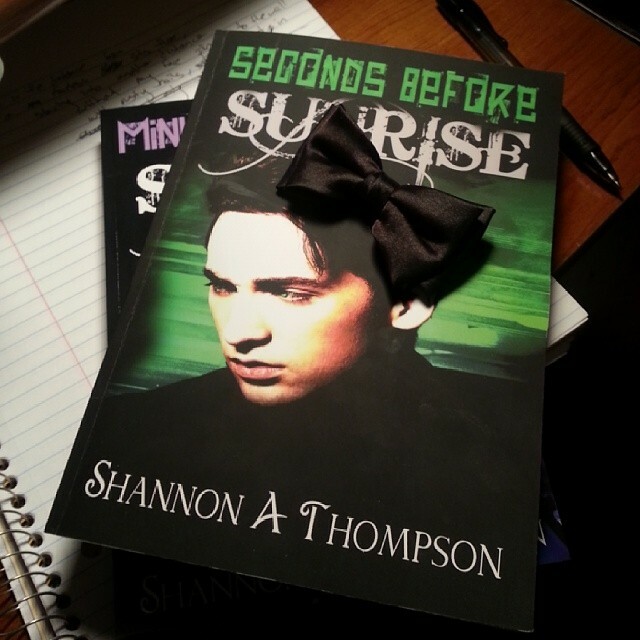 Shannon: Thank you again for speaking with me today. Be sure to visit Andrew Vogel at IMDB.